For characters like Cinderella and Rapunzel, living in a royal castle was just an unattainable dream. Gazing out the window, they would sit for hours imagining what life would be like within the walls of such a majestic place. If you’ve ever been to a Disney park, those dreams and wishes may pop into your head when you first set eyes on the magnificent castle; the symbol and iconic center of the park. 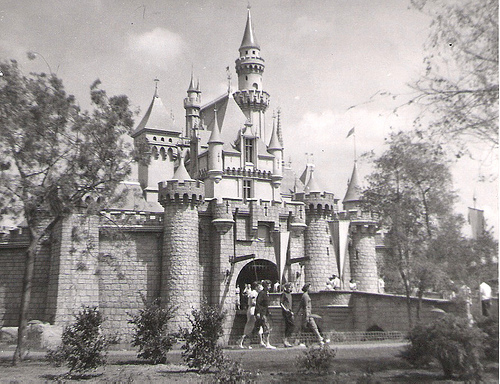 Today, I will be sharing a brief history of the very first Disney palace: Sleeping Beauty Castle in California’s Disneyland. I’ll wait for you to pull up the song…. Before the creation of artillery such as guns and cannons, castles were considered a fortress and line of defense to protect cities and villages. With the development of new military technology and weapons, the defensive role of castles was dulled down. Instead, castles were now seen by peasants as a place of wealth and status. Castles started to become more splendid, the design more grand and the interior more comfortable. 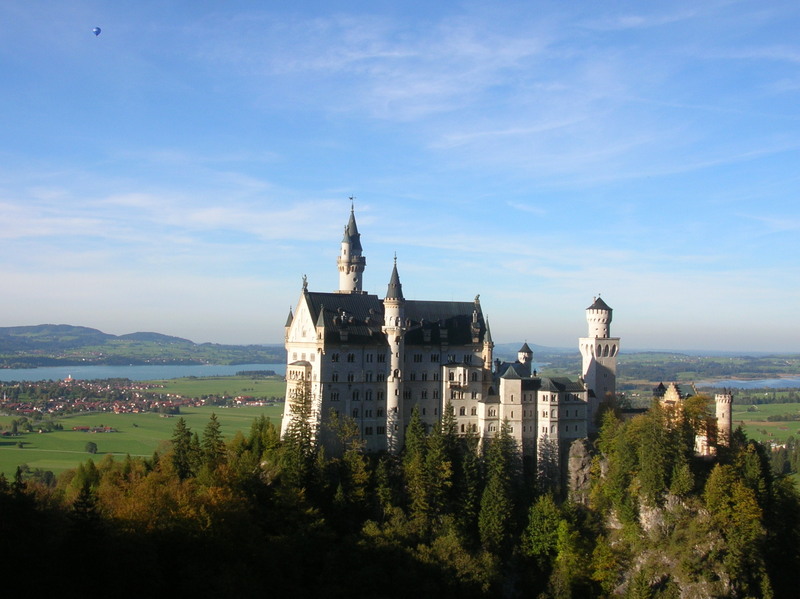 In fairy tale literature, castles became a key element and palace life became a main goal. This is thoroughly represented in several Disney films, like Snow White and the Seven Dwarfs. While doing her chores, Snow White would sing and day dream about when her Prince would come save her from a life of servitude and whisk her away to his castle. So how does this all come back to good ole’ Walt? Walt Disney had a great love of nursery rhymes and fairy tales. He used his exceptional talent of story telling in his shorts and feature length films, first in his Silly Symphonies and later in his Princess-based films. To accompany his movies, Walt had the idea in the 1940’s to create a theme park to feature the characters he had created. Originally wanting it to be called, “Mickey Mouse Park,” he purchased land in Anaheim, California (as his land across from Walt Disney Studios would not accommodate his plans). To create a castle, the parks main focus, Walt brought in scenic designer, Marvin Davis, who had been working at 20th Century Fox. Davis had his future wife, Marjorie (they met during this project), research different castles around the world. After viewing castles in Spain, France and other countries, he found inspiration from Neuschwanstein Castle, found in Germany. As movie production illustrator, Herbert Dickens Ryman, drew the first design of Disneyland park, he decided to scale down original plans of the castle and make it smaller and more friendly. Several models were then created based off of this new design. As you watch the film Sleeping Beauty, you may notice that the castle in the film and the one at Disneyland are very different. Not only did the castle at the park debut five years before the film, but the castles were designed by different artists. When talking color schemes, Walt chose the color design of Herbert Ryman (over the film’s castle designer) as the pastel shades Ryman had chosen seemed more ethereal. 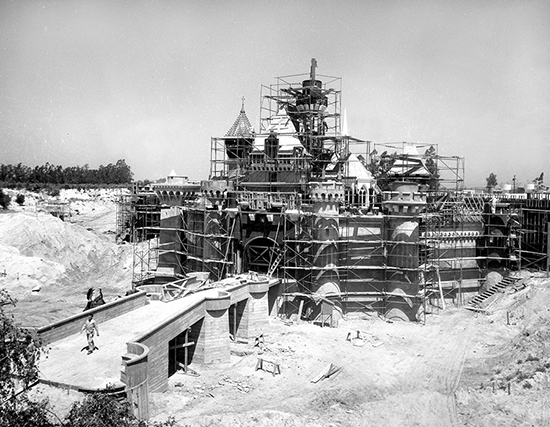 After a few design changes (and challenges) from Walt, the castle was ready to be put into production. To reproduce the 3d model, Imagineers had to call on their “movie magic” skills. To make the castle appear taller than it’s 77 feet, architects used a technique called, forced perspective. To create this effect, features such as doors and windows are full-sized at ground level, but are sized down smaller and smaller the higher up the structure goes. It tricks the eye into thinking those features are farther away, thus creating the illusion of a taller and larger building. Details were added to the project as it was built. Walt wanted the spires to be covered in 22-karat gold leaf. He knew his brother Roy would never approve the extra expense, so rumor has it he sent Roy on a business trip and authorized the detail while he was gone. Sneaky, sneaky Walt! A working drawbridge was added as well (the only working drawbridge at any Disney park), but has only been raised twice; Opening day in 1955 and the re-opening of Fantasyland in 1983. In addition to the drawbridge, landscaping around the moat and different water elements (and swans!) were included to further romanticize the castle. Years later in 1965, a Disney family coat of arms was hung above the castle’s archway. It features three lions passant, or lions that appear as if they’re walking or taking steps. Although the park opened July 17th, 1955, the interior wasn’t available to view until 1957. Guests could walk through the portcullis and observe scenes from Sleeping Beauty, depicted through hand-painted murals. However, the space inside was unused. Fun Fact: When Walt toured the unused interior, he found dozens of feral cats living inside. Maybe that’s where inspiration for the Aristocats came from! Probably not…moving on. To remedy the situation, Walt decided to use the space as a walk-through retelling of Sleeping Beauty’s story. The film’s production designer (Eyvind Earle) supervised the design. This new feature opened on April 29th, 1957. However, a new and improved version of this attraction debuted November 27th, 2008. It includes three-dimensional displays and special technology that were not yet available in the 1950’s. I found a video walkthrough here if you’d like to see for yourself! Throughout the years, the exterior of Sleeping Beauty castle has been updated and altered according to different seasons and celebrations. It has been adorned with banners and tapestries (like the most recent 60th anniversary celebration) and decorated with LED lights, or icicles, around the winter holidays. 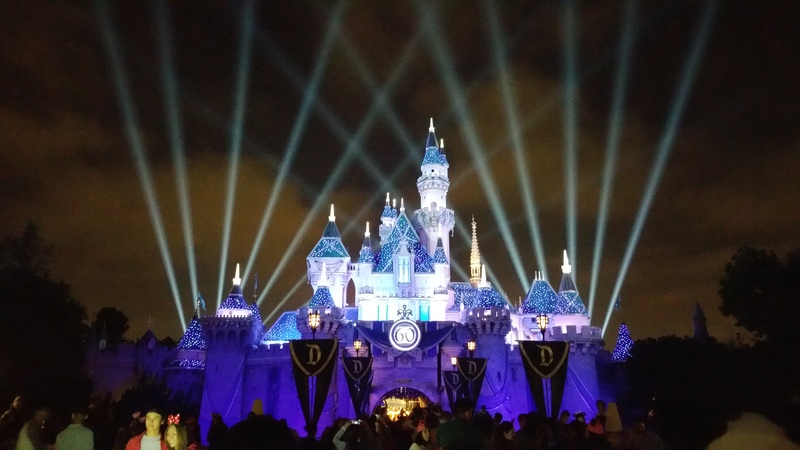 A lighting and projection system is even in place to incorporate the castle into Disneylands fireworks display. Have you walked through the castle? Would you like a history of Cinderella castle? Let me know in the comments! Yes please, would love a history of Cinderella castle post! Yes, please!!! I would love Cinderella castle as well. Thank you! 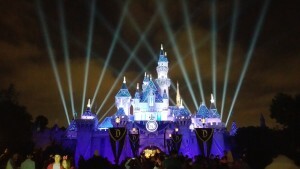 I’ve been going to Disneyland my whole life (I’m 42), I’ve probably been 100 times or more and I never knew about the Sleeping Beauty walkthrough until just a few years ago. It’s amazing that there are still things to discover at Disneyland all the time, even things that have been there all along. I’ve only done the walkthrough once as we tend to visit WDW more than Disneyland. I was quite young at the time, so it’s on my bucket list to do it again in the next few years. The new version is pretty cool, but I’m kind of sad that I never saw the old one. This is one of the best blogs I’ve read on here. More like it please! It’s comments like these that make me love what I do even more. Thank you for the kind words and look out for my Cinderella castle history in the next few weeks! I’ve had Disney fever since day 1. Just ask my parents. They can vouch that I came out of the womb singing, “Part of your World,” from The Little Mermaid.